Union Elementary School will be hosting our Annual Spring Red Cross Blood Drive on Wednesday, May 1, 2019 from 11:30 pm. to 4:00 p.m. This event allows our community to come together to give the Gift of Life. This year our school goal is to collect 30 pints of blood. The American Red Cross will be donating a free $5.00 Amazon Gift Card to everyone that signs up for our May 1st Blood Drive. Please go to www.redcrossblood.org and enter sponsor code: UnionElementary to schedule on online or call the school at 704 624-5400 to reserve your time. Kindergarten Orientation for parents and students will be held Tuesday, April 30 at 5:30. You are also invited to stay for the PTO meeting and K-2 performance at 6:30. East Union Middle School Beta Club came to read with the Pre-K through 2nd graders on Thursday April 11th. 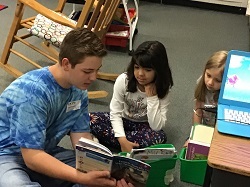 The First graders in Mrs. Jarzombek’s class loved having a middle schooler read with them. In our reading classes, we are working on Problem-Based Learning units. The students are given a problem in which they must research and collaborate to find a solution. 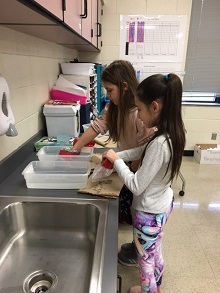 5th grade is working on The Black Death unit in which they are assigned a town in Italy during the Black Death breakout in Europe. 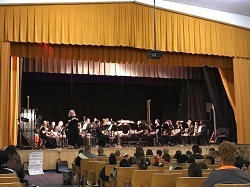 The second grade students of Union County attend the Fred Ingold Music Festival concert, held at Forest Hills High School. The Fred Ingold Festival is held every March and continues to be a special event among our second grade students.